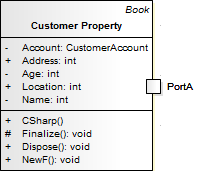 In UML Modeling, you can define certain constructs and events with structural - or embedded - elements that are added on to a parent element. For example, you can add Ports to a Class (as shown), Action Pins to an Action, or Activity Parameters to an Activity. Structural elements cannot exist by themselves, they must be part of a parent element. The 'Structural Elements' dialog lists the structural or embedded elements on the selected parent element. If you want to include inherited or owner properties from any classifier that the parent element might have, select this checkbox. Click on this button to create a new embedded element. The 'Insert New Embedded Element' dialog displays. The 'Type' field defaults to the first in the list of types of structural element you can create for the selected element. If this is not the type you need, click on the drop-down arrow and select another type. Type a name in the 'Name' field or, if you have set up auto-naming conventions, click on the Auto button to generate the name. If appropriate, in the 'Stereotype' field type the name of a stereotype to apply, or click on the drop-down arrow and select the stereotype. If you want to go straight on to create another embedded element when you save the current one, de-select the 'Close dialog on OK' checkbox. You can add as many embedded elements as you need. Click on the OK button. The embedded element is now listed on the 'Structural Elements' dialog and is depicted on the primary element, as in the Class/Port example above. Review the definition of each structural element currently associated with the selected parent element. If you have selected the 'Show Owned/Inherited' checkbox, the list will include any structural elements from any classifiers that the parent element has. If you want any structural element to be visible on the parent element on the diagram, select the checkbox next to that element's name. Notice that the 'Visible' column in this panel then shows the value True against each selected element. To hide the structural element on the diagram, clear the checkbox. The structural element still exists on the parent element, but is just not visible in the diagram. Click on these buttons to select (All) or clear (None) the checkboxes against all listed elements. If you want an inherited structural element to have different properties from the original structural element on the parent's classifier, click on that element's entry in the list and click on this button. A duplicate structured element is created in the list and on the diagram, where the Owner of the structured element is the parent element and not its classifier. You can now modify that duplicate element. If you want to change a structural element directly owned by the parent element, click on the element entry in the list and click on this button. The 'Modify Embedded Element' dialog displays, which is almost identical to the 'Insert New Embedded Element' dialog; edit the field values as necessary. On the 'Modify...' dialog the Advanced button is enabled; click on this button to display the element 'Properties' dialog and provide any characteristics the element might require, such as Notes, Tagged Values, advanced properties and related files. Click on the OK button to close the dialog and return to the 'Modify Embedded Element' dialog. If you want to remove a structural element from the parent (and therefore from the model altogether), click on that element's entry in the list and click on this button. The element is immediately deleted. Click on this button to save all changes and close the dialog.